Would you eat a Men in Black-themed ice cream Lunar Cheesecake? Every year, there's at least one summer movie that has a bizarre fast-food tie in — usually a weirdly themed Slurpee-style frozen drink. 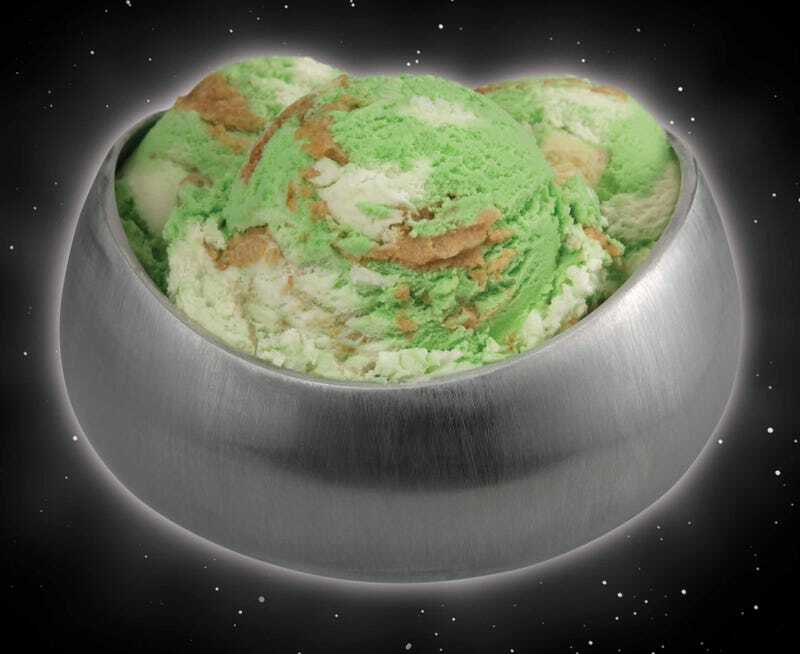 This year, my vote goes to Baskin Robbins, which just rolled out an assortment of Men in Black III-themed frozen treats, including the above "lunar cheesecake." Something about the extreme greenness of it is a bit... offputting. But it may be really tasty. Apparently, it was first introduced in 1969 for the Moon landings, and they're bringing it back for this movie. Also, according to a separate press release, sister company Dunkin Donuts is rolling out the "Undercover Black Cocoa Donut, a star-shaped yeast donut filled with brownie batter butter creme and topped with chocolate icing and star sprinkles." And the Chocolate Lunarmax Donut, "a glazed chocolate cake donut with rich chocolate icing drizzle and star sprinkles." Actually, that last item sounds pretty tasty.